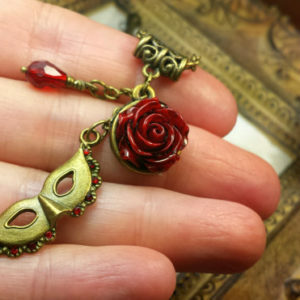 This whimsical Pendant Charm Necklace dazzles the senses in an entrancing rich Crimson Red glow. 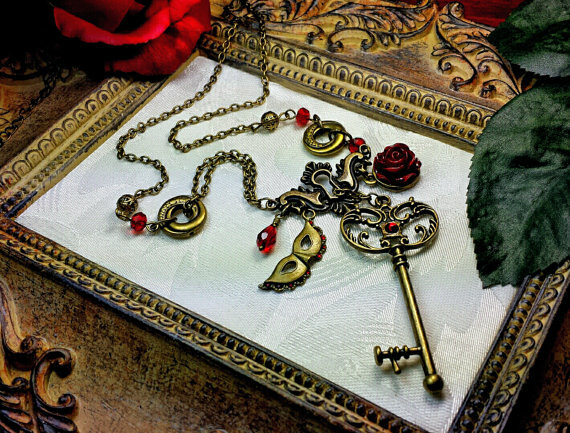 A captivating Hand Tinted Blood Red Resin Rose, and ornately scrolled Antiqued Brass Skeleton Key, forms the focal point for this amazing design. 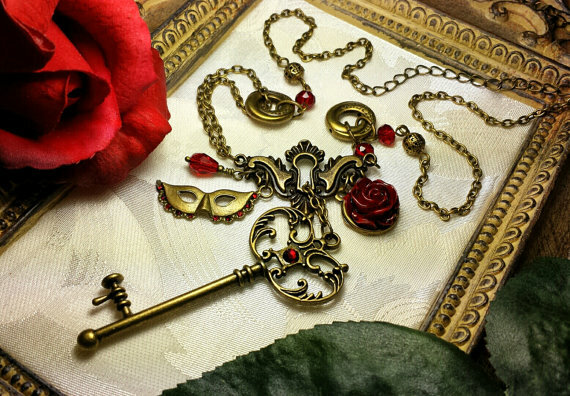 Accenting this piece is a fanciful Antiqued Brass Filigree Masquerade Mask, sparkling with light and dark Red Chaton Crystal Rhinestones. 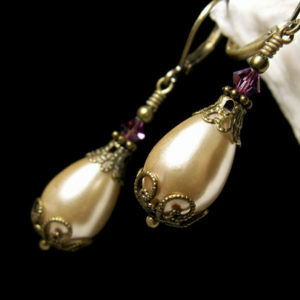 And dangling alongside is a tiny Garnet Red Faceted Teardrop Crystal, as well as deep Red Rondelle Crystals shimmering with every movement. 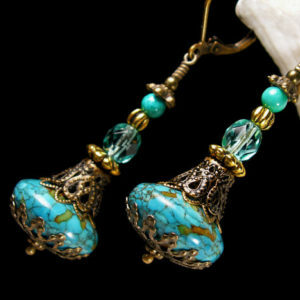 All comfortably secured by an Antiqued Brass Chain and fanciful findings, with an Adjustable Chain End Section, held by a Vintage Style Brass Lobster Clasp, this enchanting dangle beautifully portrays the captivating Victorian Ambiance. This design also wonderfully captures the essence of the Vintage Edwardian Style, perfect for Steampunk, with Renaissance undertones. Carefully constructed of a Hand Tinted Resin Rose and Faceted Crystal Teardrop. 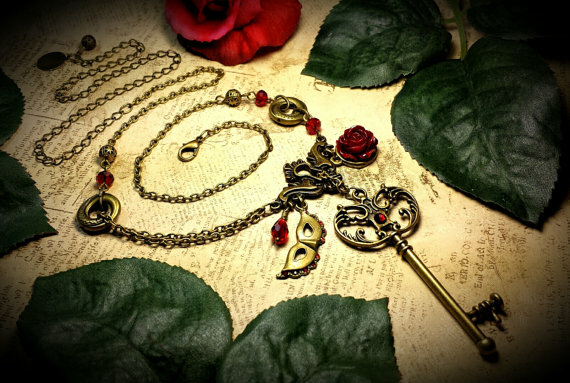 Ornately Scrolled Brass Skeleton Key and Antiqued Brass Masquerade Mask Charm. 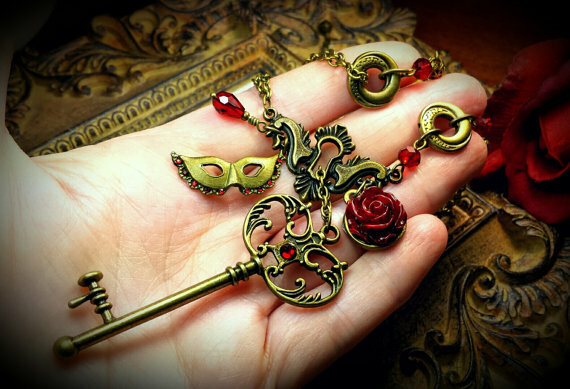 Antiqued Brass Key Hole Connector and Fanciful Findings. 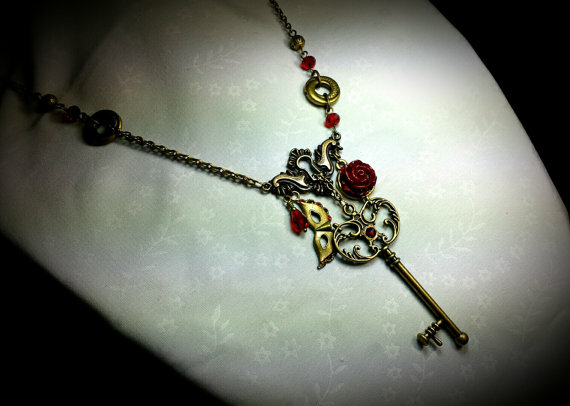 All secured by an Antiqued Brass Chain with an Adjustable Chain End Section, held by a Vintage Style Lobster Claw Clasp. 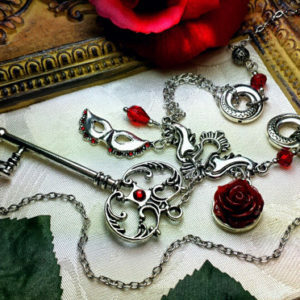 This intricate piece was made to bring many years of enjoyment to the wearer. Thank you for your visit And have a Lovely Day!